There are spots still open for a bus trip to Brooklyn Botanic Garden, courtesy of Bethpage Public Library! On this self-guided tour, you will see the garden’s 42 varieties of ornamental flowering cherry trees in gorgeous bloom. Afterward, you will enjoy a three-course lunch at Brooklyn’s famous Junior’srestaurant. Entrée choices (choose at registration) are fried cod, broiled cod, roasted chicken or brisket of beef, all served with potato and vegetable. Dessert choices (choose at the table) are fruit pie, ice cream or Junior’s famous plain cheesecake. Coffee tea or soda also included. $89 – cash, credit card or check payable to Bethpage Public Library, no refunds, rain or shine. Please return to the bus at 5:00 PM, we will return to the library approximately by 6:00 PM. Join the library for a fun-filled family bus trip to the Bronx Zoo. Lunch is not included. You can either bring your lunch or purchase food at the zoo. The cost includes transportation, bus driver’s gratuity and parking fee. Monthly meeting for NCLA's Young Adult Services Division Executive Board. All NCLA members are welcome to attend. 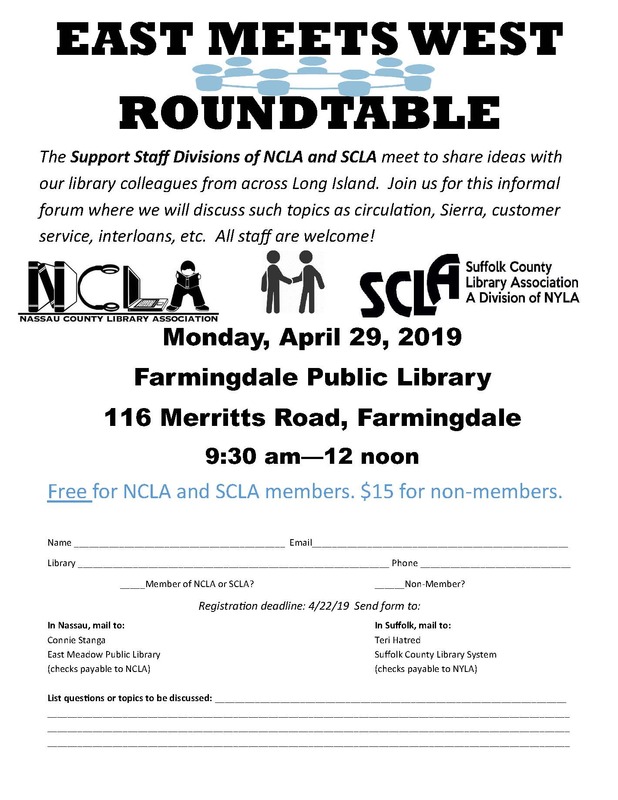 The Support Staff Divisions of NCLA and SCLA invite you to our East Meets West Roundtable Discussion. All staff are welcome. Hope to see you there! Presented by the Continuing Education Committee. Join psychologist Drew Velting for this topical and informative lecture.. A brief musical presentation will conclude the program. Fees are $5 for NCLA, SCLa members and library school students, and $20 for all others. Flyers coming soon. Division of Academic and Special Libraries (DASL?) of SCLA? ?VR Art Instruction: Transformative Learning and Enhanced Creativity through the use of Virtual Realities presented by Fabio Montella, Assistant Professor of Library Services, Suffolk County Community College/East Campus? Please see the conference page here? for more detailed information and to register. Building connections with fellow librarians provides mutual benefits that can help you reach your career goals. Join the NCLA Emerging Librarians Committee for a unique opportunity to network with new and established librarians. Students, recent grads, as well as those in the field are all welcome. This program is free of charge and open to NCLA and non-NCLA members. Space is limited so please register by May 1st. The NCLA Executive Board meets monthly, except for July and August. Please check the calendar for meeting dates. All NCLA members are welcome to attend. Please join us for the NCLA Emerging Librarians Committee's monthly meeting. 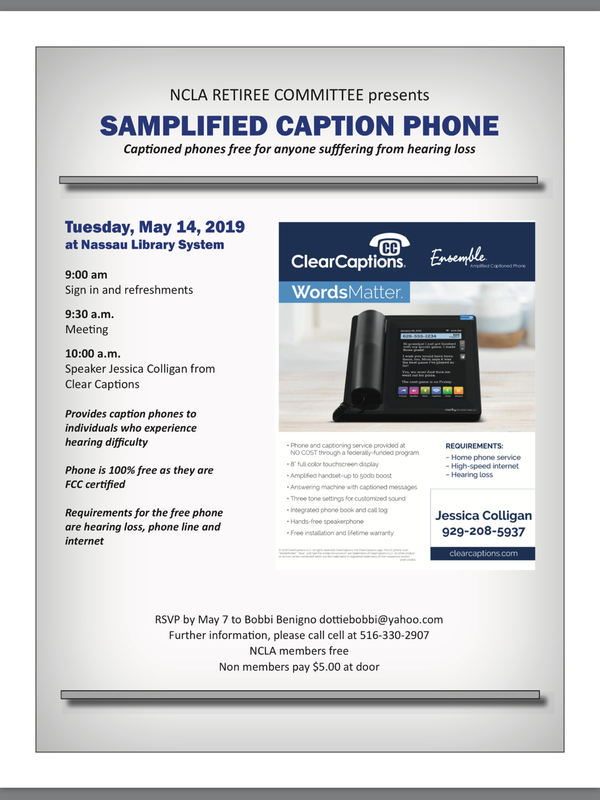 Learn about the Samplified Caption Phone from ClearCaptions, free for anyone with hearing loss. The devices are FCC certified and require a phone line and Internet connection to use. RSVP by May 7 to Bobbi Benigno (dottiebobbi@yahoo.com). NCLA members: FREE; non-members; $5.00 at door. For further information, please call 516-330-2907 or see the flyer. Please consider joining the Children's Service Division on a trip to the Museum of the City of New York on May 17 at 12:00 pm! We will have a guided tour of the exhibit A City for Corduroy: Don Freeman's New York. Our tour will be followed by an optional lunch at a location to be determined. Attendees responsible for the cost of their lunch. Feel free to send the CSD Board an email if you have any questions. $10.00 for members and $25.00 for non-members. Please makle checks payable to NCLA and send to Long Beach Library, Attn. Bianca Rivera by May 1, 2019. Monthly meeting for NCLA's Children's Services Division Executive Board. Network with other librarians and help us to plan events. Sail the Great South Bay with Captain Mike aboard the beautiful Lauren Kristy, a 65 foot turn-of-the-century style riverboat. $88.00 per person which includes gratuity for bus driver. Check payable to West Hempstead Public Library. Network with other librarians and help us plan events.